There’s another letter from me in the current issue of Fortean Times. They’ve printed it under the title of “Damned Data” (which of course was Charles Fort’s term for Fortean data), although my original title was “Damned Data and Statistics”... alluding to the cliché about “Lies, Damned Lies and Statistics”. Personally I think statistics is a very useful tool for organizing and understanding data, and it’s a shame it has such a bad reputation with the general public. 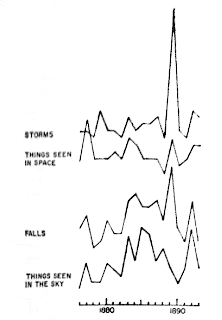 Presumably for that reason, there have been very few serious attempts to apply statistical methods to Fortean data: one notable exception can be found in Damon Knight’s biography Charles Fort: Prophet of the Unexplained (the picture on the left comes from Paul Jackson’s copy of the book). 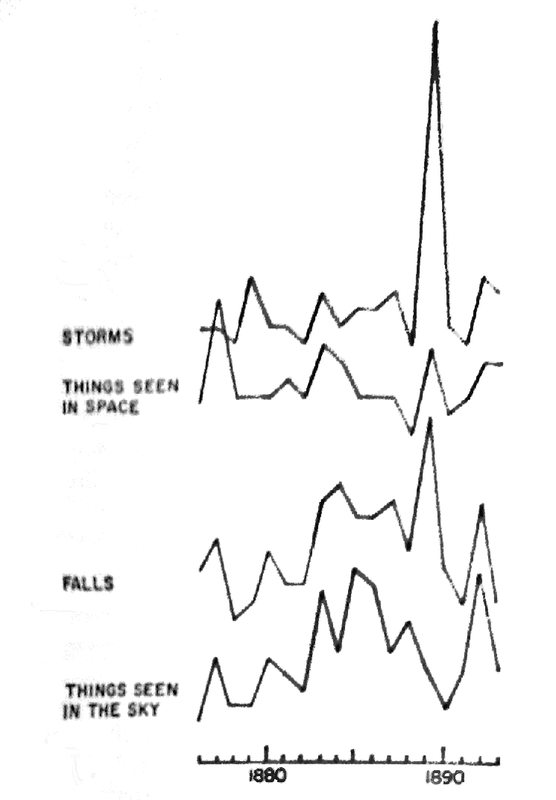 People often think of statistics as just “number crunching” -- for example analysing how often events of a particular type occur (as in the case illustrated above). But another, more interesting, use of statistics is to test a hypothesis against the observed data. The Bayesian approach (which I mentioned in the letter to Fortean Times, and which was discussed by Ian Simmons in an FT article way back in June 2000) is a case in point. If you have a number of competing hypotheses (or “theories”, in the everyday sense of the word), then Bayes’ Theorem allows you to calculate the probability of each hypothesis being correct given the observed data. The catch, however, is that any old arm-waving hypothesis won’t do -- it has to be a hypothesis with precisely defined mathematical predictions. And that’s where most Fortean hypotheses fall down! But the situation isn’t hopeless. After I sent the letter to FT, I did happen across a scientific paper that addresses a quasi-Fortean problem using Bayesian statistics. I mentioned this a few weeks ago in Searching for Alien Artifacts -- the paper is called “On the likelihood of non-terrestrial artifacts in the Solar System”, and it uses Bayes' Theorem to estimate the probability that an undetected alien space probe exists somewhere in the Solar System. The reason this problem is amenable to mathematical treatment, when so many Fortean problems aren’t, is that you don’t need to know anything about the properties of the alien spacecraft or where it came from or what it’s doing -- all you need to know is whether current technology could detect it or not. You could extend the same idea to other Fortean subjects, such as searching for the Orang Pendek, Yeti or other cryptids. With regard to my own Fortean statistics, things are looking up. When I started this blog at the end of January last year, I mentioned that Fortean Times hardly ever printed any of my letters. This was true: I’d sent them fifteen letters over a period of fifteen years, and only three of them had seen print. Since then, I’ve sent five more letters and all of them have been printed! On top of that, I’ve had one erratum and two book reviews printed as well -- making a grand total of eight appearances in twelve issues. I’m not sure how long this “lucky streak” will last, but it makes a good impression on my Fortean CV!